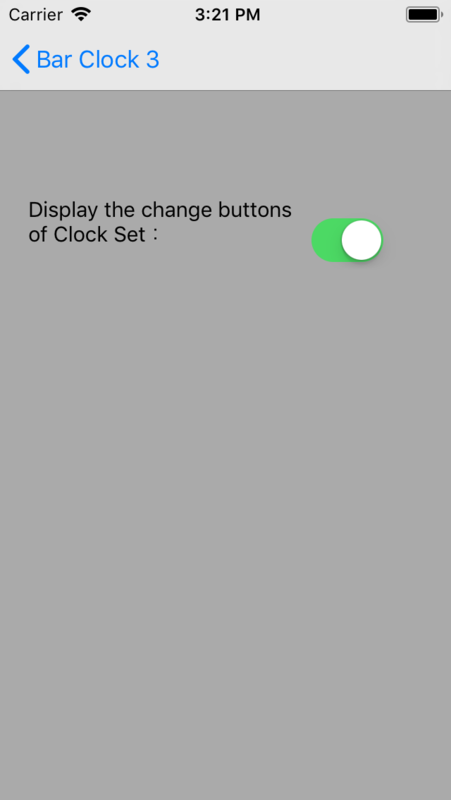 Bar Clock 3 is the clock, calendar application which display a date,a time in the Bar chart Format. The present date in the range can be grasped by specifying start time and end time. It can use in the project of the work and the long-term vacation as well. This screen is diplayed the bar graph set which is the group of bar graph. The bar chart is drawn in each time range. 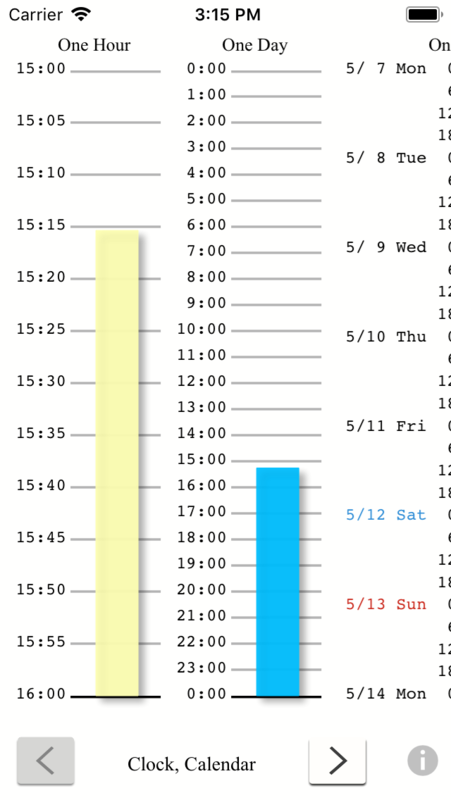 The bar chart is indicated a present date,time in its range. Drawing is done in every 15 seconds. Change to the bar graph set data whose order is high. Change to the bar graph set data whose order is low. The name of bar graph set is displayed. 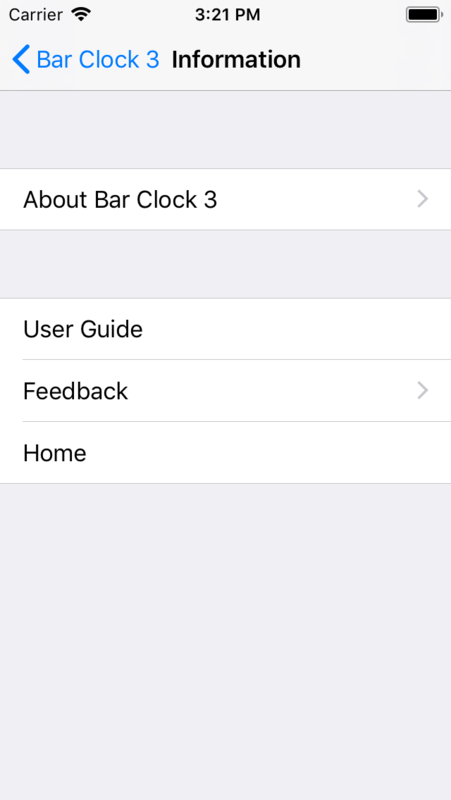 The menu about bar graph, bar graph set is displayed. The vidual bar charts is drawn. The bar graph set appeared at first is the top of the bar graph set list in "Change Bar Graph Set Order" screen. Set the display order of bar graph set. Display the bar graph set list already exists. Display the bar graph list already exists. All bar graphs in this app are listed on this screen. 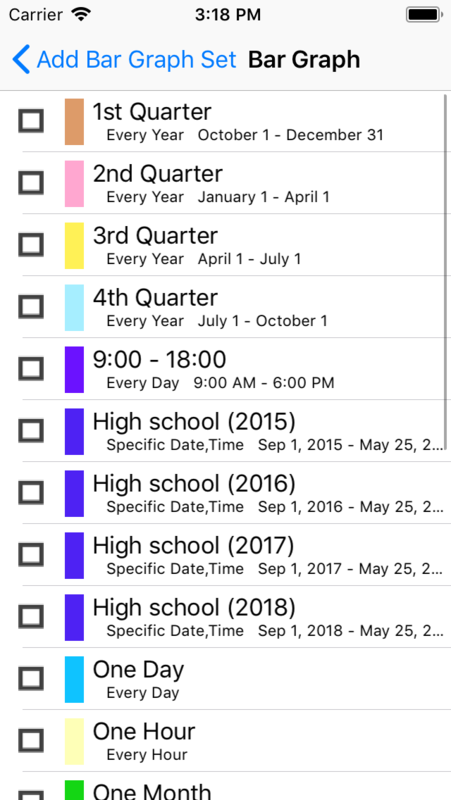 The bar graph color is displayed on the left side of the list item. The bar graph type, start date, end date are displayed under the name. Move to "Add Bar Graph" screen. 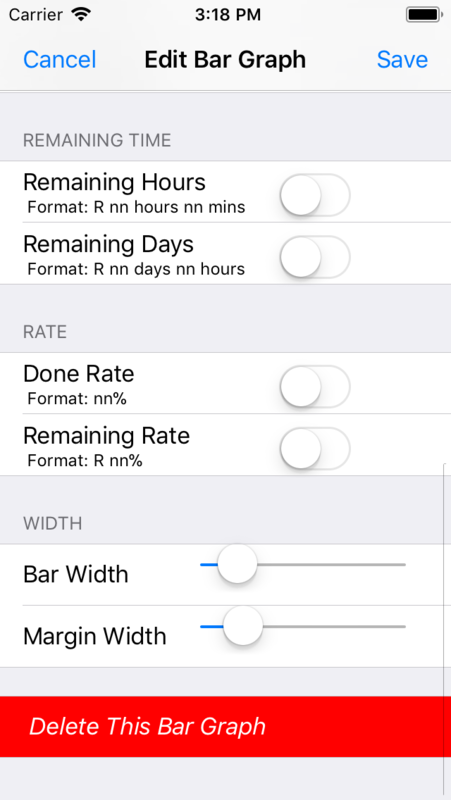 Move to "Edit Bar Graph" screen which can edit,delete, when it's tapped. This is the screen to input each data of the bar graph data. 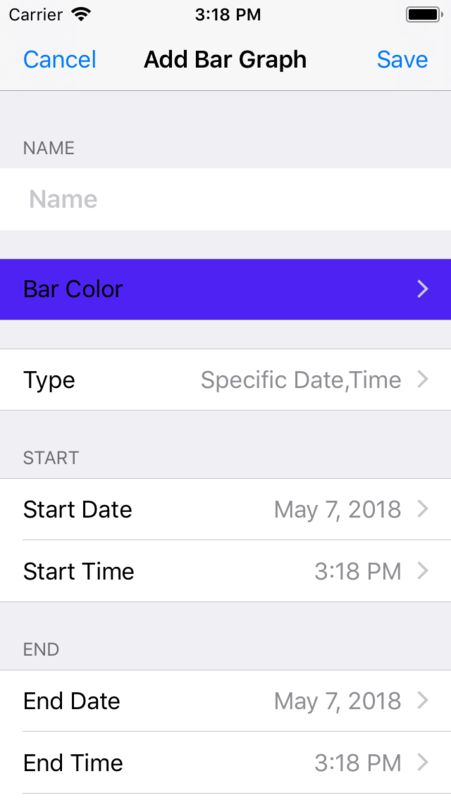 When Name,Type,Bar Color, start date time, end date time are entered and [ Save ] button is pressed, Its new data is registered. 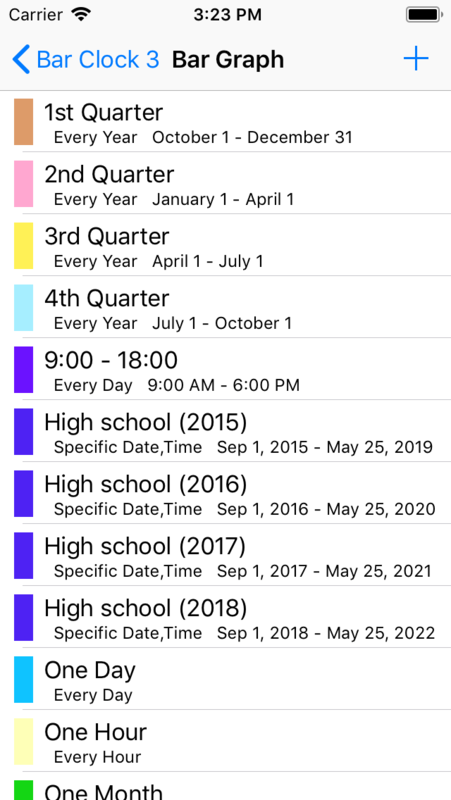 Select the alert sound which ringed when a bar graph reaches the end date,time line. If "Nothing" is selected, the sound is not ringed. It's the switch of the rate of the time when it passed. It's written under the bar graph. It's the switch of the rate of the time when it is still left. It's written under the bar graph. Specify the width of bar of the bar graph. Specify the width of the margin on both sides of the bar graph. 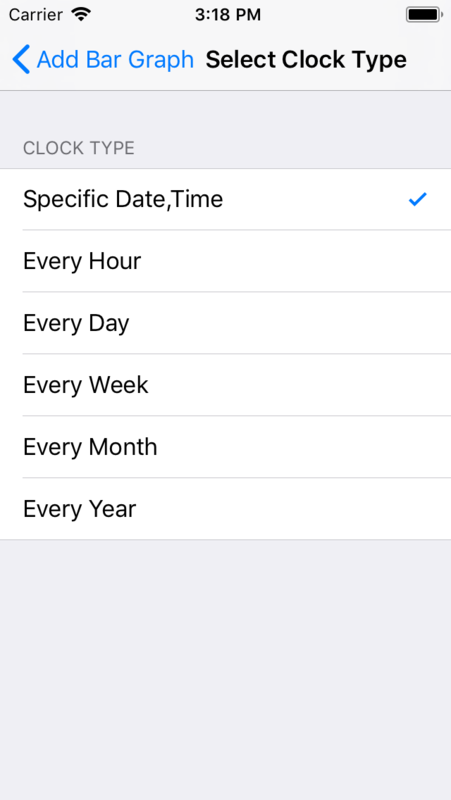 The start date, end date set up automatically is changed by the Clock Type specified on the "Add Bar Graph" screen. The bar graph is drawn between the specific start date,time and the specific end date,time. 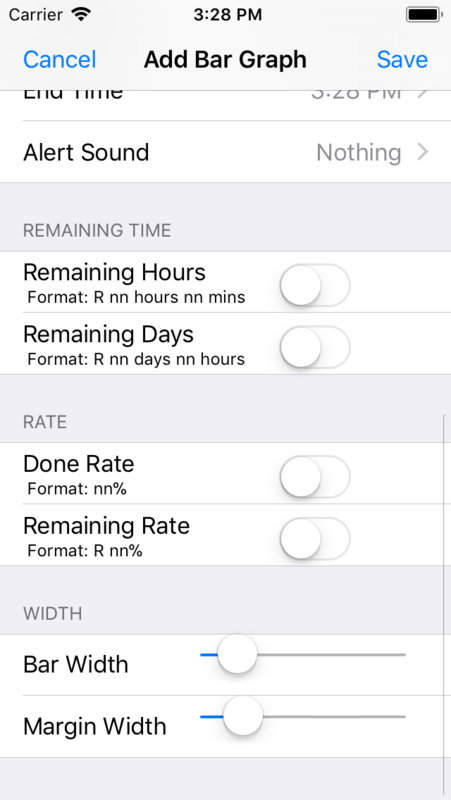 The bar graph is drawn between the minutes specified hourly. The bar graph is drawn between the times specified every day. The bar graph is drawn between the days of the week, the times specified every week. The bar graph is drawn between the days,the times specified every month. If the day which doesn't exist in the present month (30,31,etc) is specified, it is changed to the last day of the month. These items of the bar graph are modifiable. Tap the [ Save ] button to save the items changed. This screen is the list of the bar graph set which is the group of the bar graphs. 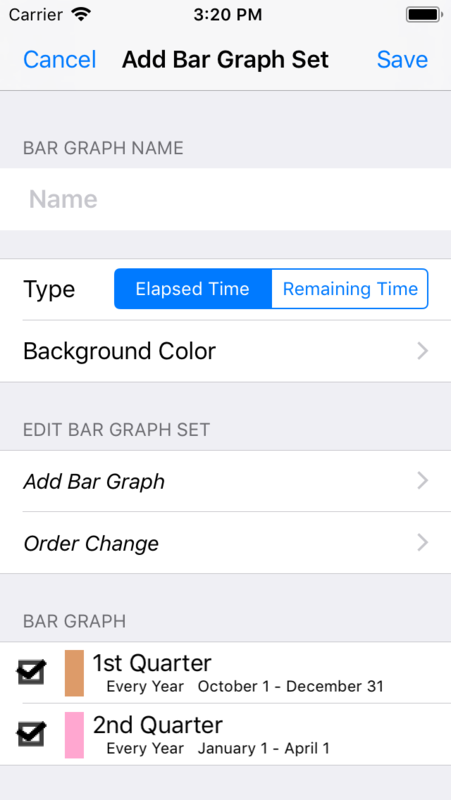 Move to "Add Bar Graph Set" screen. The name of bar graph set data is diplayed. 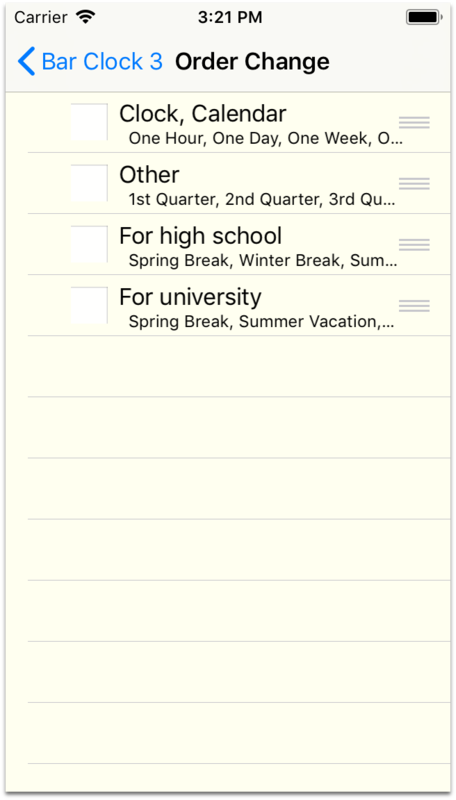 The background color is displayed on the left side of the list item. 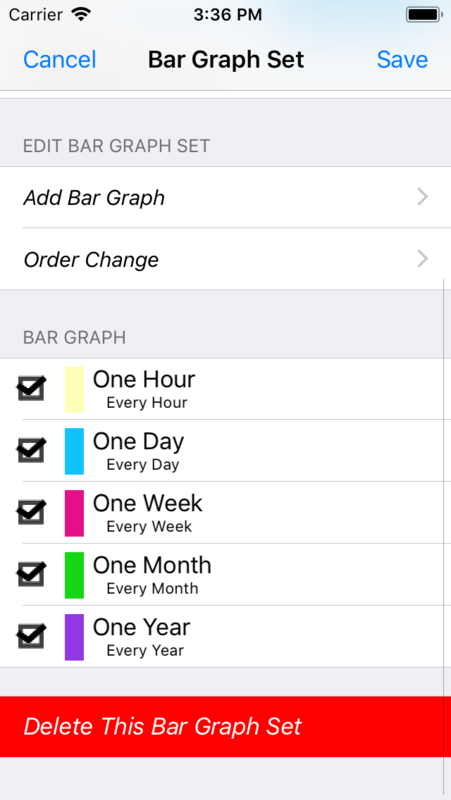 Tap the list item to move to Bar Graph set edit screen. This screen is for making new bar graph set data. When Name,Background Color,belonged bar graph are entered, and pressed [ Save ] button, the new bar graph set data is registered. Set the background color of bar graph set (back color of bar chart). Select from all bar graphs list. The display order of the bar graphs can be changed. When the item is removed, the check of the item is missed. All bar graph data are listed on this screen. These can be chosen in the plural at the same time. The items of the bar graph set data can be changed on this screen. 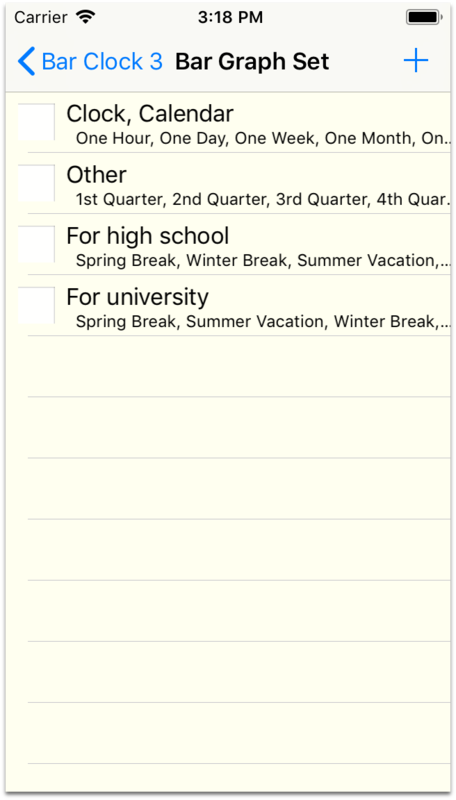 Tap [ Save ] button to save the items changed and be reflected to the list. When [ Delete This Bar Graph Set ] buttn is pressed, The message dialog is displayed. The [ Delete ] button of its dialog is pressed. this bar graph set data are deleted. 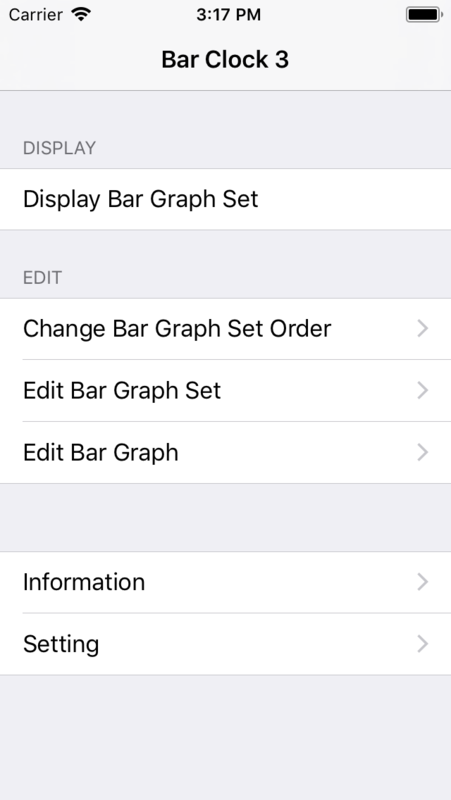 The display order of the bar graph set can be changed on this screen. The right mark of the list item is dragged to up or low, the order is changed. There are the links of the credit screen, the user guide. This is "display/hidden" switch of [ < ], [ > ] buttons of "Display Bar Graph Set" screen. If this swich is OFF, [ < ], [ > ] buttons are hidden on "Display Bar Graph Set" screen.